My mind went to a kid named Bill and an odd jumble of a pink house, in a small town in Texas. Bill you see, was my first boyfriend (at least in my mind he was. Bill may have a different story). I was all of 7 years old. I can’t remember how I first met Bill. I think perhaps it was the day he was in his back yard, hands on his hips, contemplating a peeling wooden dog house that looked like it was being held together by maybe two nails at the most. I, in my own backyard, ambled over, introduced myself, and somehow we ended up with various cans of rusted old paint and some dried out brushes we found in a shed, and we were giving the little structure a fresh new look. As one of my first outside art installations, I remember my motif included some nice flowers, which I assume were daisies, along the side, in multi hues. Not to be negligent, I also had the idea that the dog should have something nice to look at while in the house as well, and promptly painted some scenes on the inside too. I don’t remember if the dog house was big, or if I was just small, but yes, there was enough room for me to paint inside. And in fact, I don’t remember there ever even being a dog, now that I think about it. But that didn’t seem to matter. Our visits house to house became so frequent in fact, that either Bill’s parents or mine—I can’t remember which— put a gate in the chain link fence separating our properties, so neither of us would be climbing it henceforth and ripping holes in our jeans or worse, our legs. Very convenient this, because we had a lot of work to do. Instead of being a regular square shape like most abodes in the neighborhood, this house was made of wood instead of brick, and was an odd jumble of at least 4 different geometrical shapes, all fitted together without rhyme of reason, and connected with tacked on wooden halls, as if they were arteries going into a four chambered heart. It was like a fun house had mated with a New Orleans Painted Lady. And I loved it. Nothing like Pepto Bismol pink! Recently my brother told me that before Bill’s family, at some point, the house had been occupied by one Charles B. Pierce, the director and producer of “The Boggy Creek Monster” and the “Town that Dreaded Sundown.” Two movies, one documenting our area's local monster, and the other not so lovingly, our most famous serial killer. Mr. Pierce must have been quite the eccentric. And I can almost picture some frenzied, coffee-fueled, scriptwriting going on in one of those lego block rooms in some begone day. 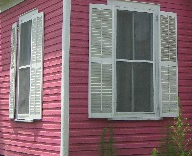 Whatever it’s pedigree, the pink house became mine and Bill’s stage for many adventures. There were also melancholy times... for instance when we found a baby owl near Bill’s front porch, and how we tried to nurse it back to health, it’s large black eyes looking up with a mixture of fear and futility. We failed. I know I cried that day. I think Bill did too. Bill’s Mom gave us icing covered Pop Tarts, which she always seemed to have in great supply. And we gave the owl a little funeral in a small cardboard shoe box. I believe Bill said a few appropriate words. When I think of Bill, I remember him with dark hair and brown eyes. Wouldn’t it be funny if I was completely wrong. Memory is an odd thing, the patina of time makes the Polaroids in ones mind fuzzy around the edges. There was a time when “Star Trek” was on every afternoon following school, and it became an obsession for Bill and I to dash home to watch it every day, then, of course, run outside to re-enact that afternoon’s scenario, in the large yard studded by evergreen pines around the Pink Lady. For some reason, unbeknownst to me, Bill always had to play Captain Kirk, which left me with the rest of the cast to choose from. Even then, we were a great team. Rifling through the toy barn (also painted pink)—that magical shed on the property, full of those rusty cans of paint that people save “Just in case,” and various pieces of long destroyed toys—looking for objects that could substitute for communicators and ray guns or alien artifacts harboring great and misunderstood power. It wasn’t long before my acting chops needed a boost however, and I suggested to Bill, that regardless of the fact that I was a girl, that if we used our imaginations, that I could also perhaps play Spock. He was one of my favorite characters after all. And thus, the next day, the transformation was made. And I wasted no time perfecting my Vulcan Nerve Pinch and writing it in to the "original lost episodes" that we began to scribe ourselves. Charles B. Pierce would have been proud. Sometimes it would be Kirk that would rescue Spock, sometimes vice versa, but it was all quite the adventure, taking turns saving each other, you know. Of course, it did cut down on the kissing scenes. I have to say that some of my finest acting to date may have been on the stage of our pink house and environs—explaining logic to “Jim” and shooting our ray guns— which may have formerly been parts of a T-Rex— at an onslaught of Romulans. And as for me, I was perfectly happy in my new role of Spock. It seemed…well… logical. I’m not sure when the last time I saw Bill might have been. It’s lost in my memory, filed away perhaps in the folder entitled “Things I choose not to remember.” But the end for me seemed to be comprised of two major events. The first, probably mostly major to me….We were out playing putt-putt on a bright summer afternoon, and Bill, with his usual theatrics and joie de vivre, decided to swing the club back like he was really playing golf. Think: A steel mallet at full force. I had the misfortune of standing behind him and being hit square in the head, opening a huge bloody gash right on my eyebrow. It’s true what they say about head wounds. They bleed. A lot. After leaving behind huge red puddles on the nice new cement of the Putt Putt Golf, a visit to the hospital and numerous stitches, Bill and his Dad came over to our house--a hollow knock on the garage door. Bill was standing there, so upset, he seemed to have shrunk in size somehow, shoulder's down, apologizing to me. I didn’t really understand why. It was a accident. I knew he felt bad. His eyes said “I’m sorry I didn’t save you this time” more than the words. I remember mostly his eyes. For some reason, my mind has erased such moments for the second event... I remember it as if someone told me about it. Like they were people I didn’t know. But I know that’s not true. Bill’s Mom worked with my Mom at the local Sears store. My Mom was the bosses secretary at the time (she later worked her way up to personnel manager). I can’t remember what Bill’s Mom did. I do remember that she was sweet and kind. (Note the aforementioned iced Pop Tarts). And she smiled a lot. My Mom and Bill’s were friends, and met almost every day at the Sear’s coffee shop for their break. The shop was a glass enclosed 1970’s little place on the corner of the building, with Formica tables and colorful plastic chairs, and a grand view of the parking lot. One day, Mom was running late and didn’t make it to their usual coffee break on time. A car crashed through the glass window that day, killing Bill’s Mom, as she sat there alone. Just drinking coffee. She may have been the first person I ever knew who died. I don’t know how long it was after that, but Bill’s Dad remarried. They sold the old pink house and moved away. Eventually a lock appeared on the gate between our properties. I have thought about all of these things. Most within a few minutes of hearing of Mr. Nimoy’s death. I’m sure too, that your mind took you on a journey as well, also uniquely your own…a journey that made you think what relevance he had in your own life. 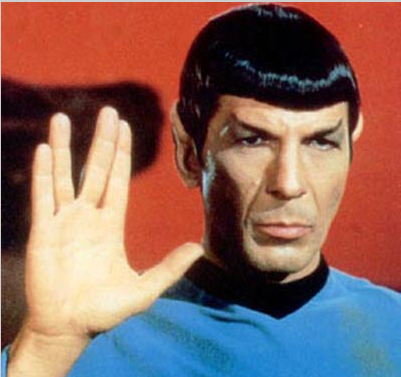 I wonder if someone like Mr. Nimoy understood all that? I mean…how much those characters were a part of our memories. I like to think that he did. I know he embraced what he had created, at least later on. And that he understood that the character— that ensemble cast, the stories—meant something to a great deal of people. I love it too, that he created the Vulcan Nerve Pinch because he was tired of staged on-screen fights, and he also created the “V” symbol that every single one of use who grew up on the show practiced over and over again until we got it. Admit it, how many of you automatically did that “V” symbol within moments of hearing of his passing! I know you did, and it makes me smile. In my current line of work, I've have the great fortune to travel near and far to places that as a child I could only dream of going. China, Russia, Brazil, Chile...Madison, Wisconsin! To a little girl full of imagination, growing up in a small Texas town, they would all have seemed as equally exotic to me and unattainable...except for the fact that at 7, I had already traveled frequently to the Klingon home planet of Kronos! I think you can see the essence in his character by the fact that he took the high road and remained friends with all his Star Trek co-stars during times when many of them were squabbling with each other and didn’t talk for years. So, here’s to you Mr. Nimoy for the inspiration, the joy, and whatever that secret ingredient was that you guys added that made us want to be you. And for the hint, dare I say hope, via your show— which really was positive— that perhaps nobility and friendship are things that will always exist. "Kirk: I want you to know why I couldn't let you die... why I went back for you..."
"Spock: Because you are my friend." When I’m home at my Mom’s in Texas, I sometimes sit in my Dad’s old chair by the backyard window— the chair he used each night when he was alive, and I look through the trees towards the old pink house— still there, still painted like Pepto-Bismol, but needing a new coat… or perhaps some nice daisies along the sides…if only one could find a few squirreled away rusty cans of paint and a young soul or two to do it…and I still see imprinted on that canvas what use to be. And I find myself reaching up without realizing , to touch the “putt putt” scar, hidden by my brow. Then... 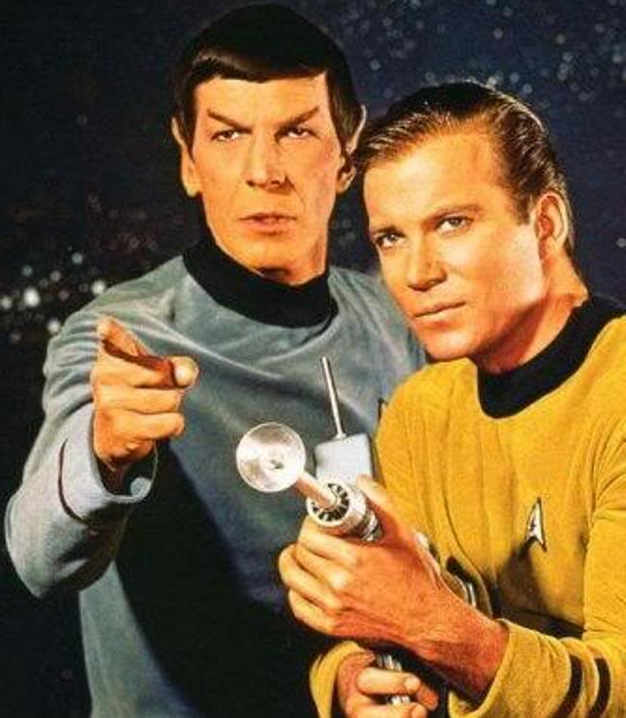 I remember Bill and I remember “Star Trek,” and I see an 8 year old Captain Kirk and a not so logical Spock, boldly setting out to change the world . Not really knowing at that point what the world even was. 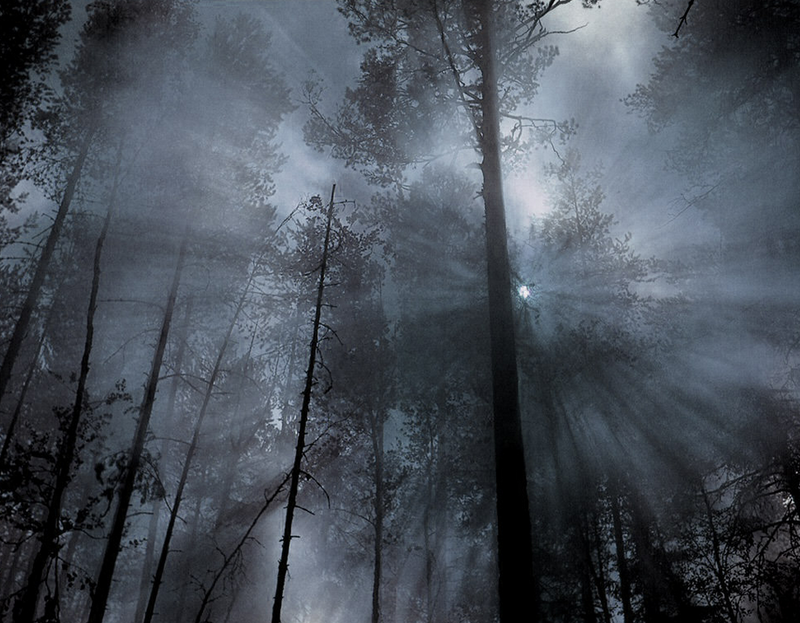 Yet on our little plot of soil, turned into a vast universe in our imaginations, it somehow seemed…well… limitless. And you know what, Mr. Spock, as illogical as it might be, thanks in part to you, I still feel the same. 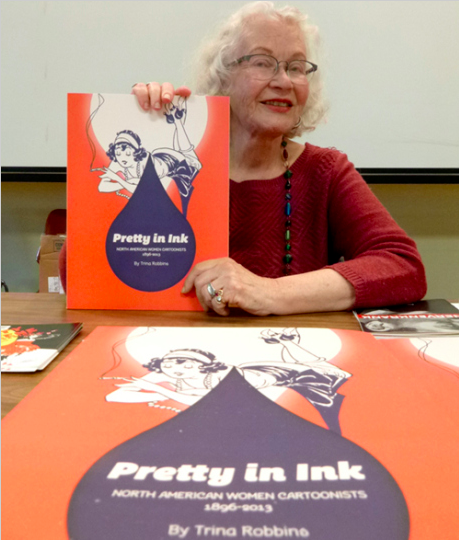 Historian/Writer Trina Robbins Available for Booking! 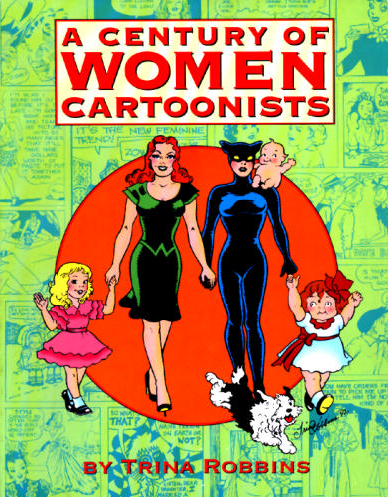 the amazing Eisner Hall of Fame member,   Trina Robbins. Here is a little bit about Trina below. 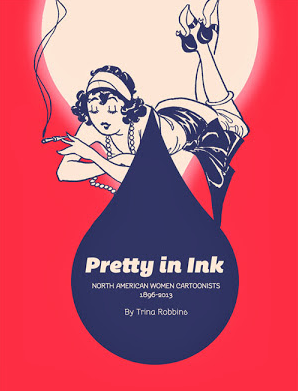 Just a few of the books by Trina Robbins. 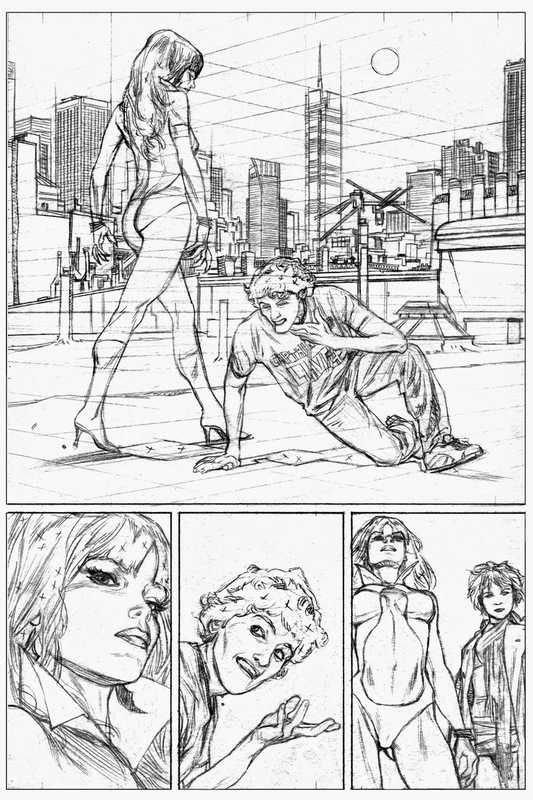 Legendary Spider-Man Editor Jim Salicrup Available for Booking! 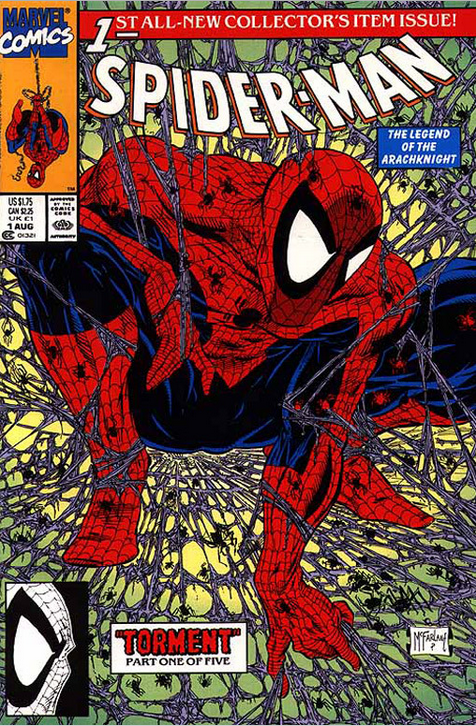 Jim Salicrup is noted as the editor on Todd McFarlane's Spider-Man run. 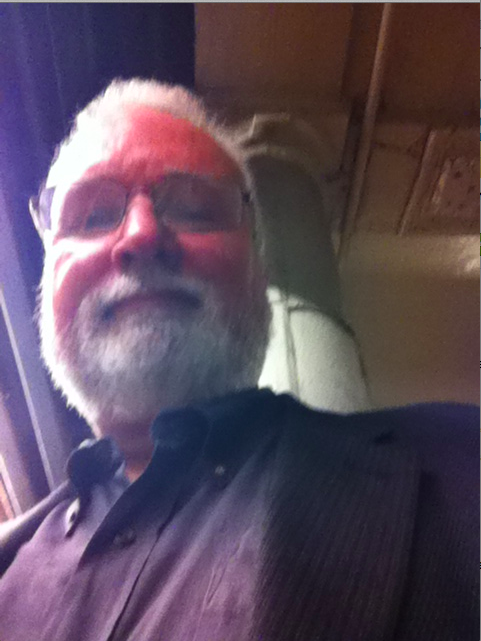 Hi Everyone-- Happy to announce that we are doing some limited booking for one of my best friends in the industry, not to mention a mentor, Jim Salicrup. Here is a little bit about Jim below. 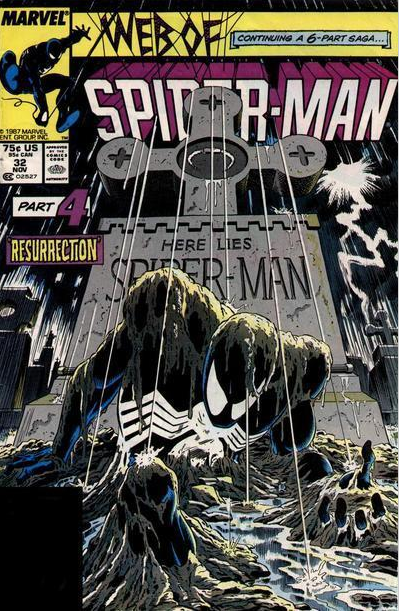 Black Spider-Man costume in "Kraven's Last Hunt," drawn by Mike Zeck. 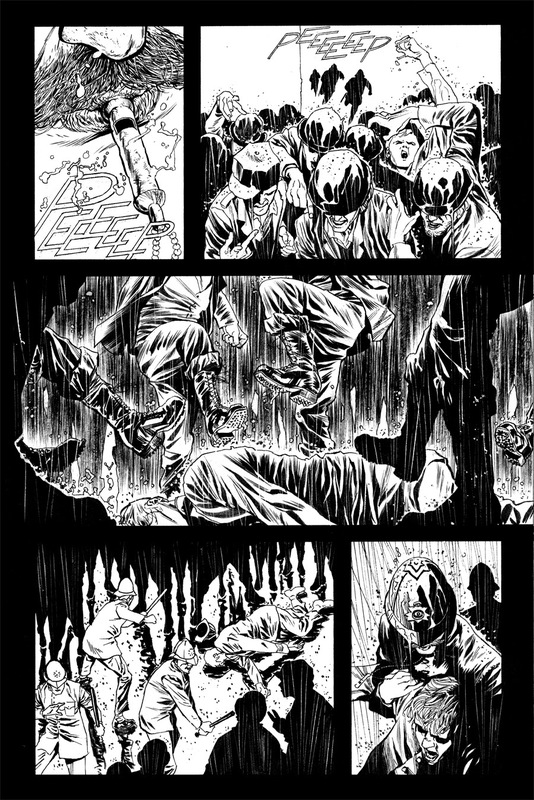 Artist Matt Triano-- Commission List Opens! 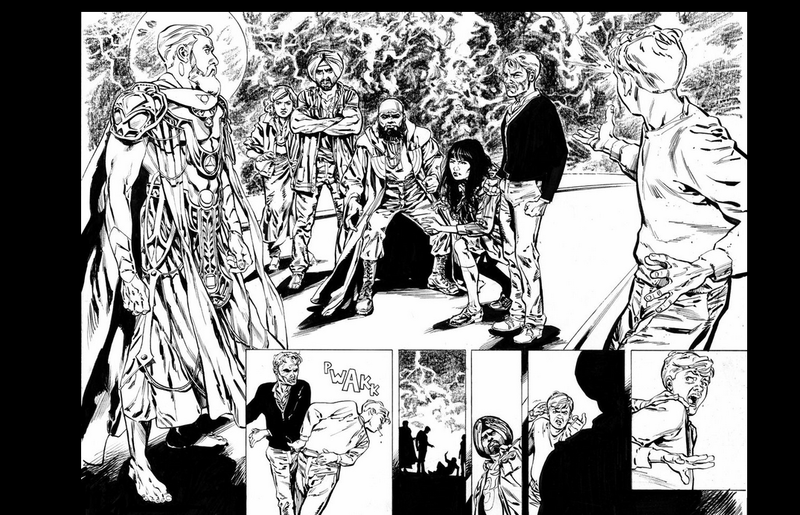 Double Page Spread from "The Devilers"
Eva Ink Artist Group is pleased to announce that artist Matt Triano will be accepting a limited number of commissions. Matt Triano is known for his illustrative work on both super-hero and fantasy/horror projects. "Grimm's Myths and Legends," "Robyn Hood," "Call of Wonderland," "Sleepy Hollow," "The Story of Mankind" for the Discovery Channel, "Shark Week" illustrations for Discovery Channel, "The Shadow," "The Lone Ranger Annual," and more, highlight his amazing work and insistence on research and story setting. His attention to detail and design has most recently been seen in the series "Sherlock Holmes: The Liverpool Demon," which was released to great reviews. And the new series from Dynamite Entertainment, “Devilers,” on which Matt also did designs. When commissioning a piece, it is the character of your choice and there are options available for head shots, torsos and full figures. 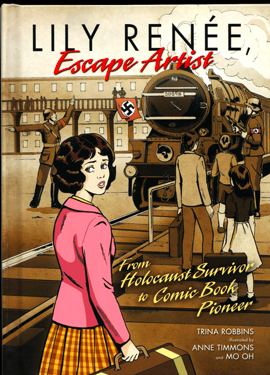 Blank comic book covers are also being accepted. 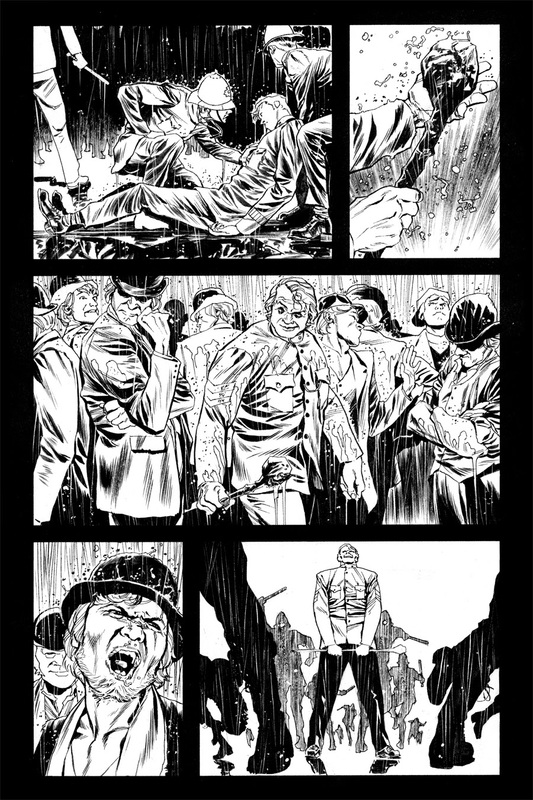 Above and Below: Sherlock Holmes pencils from "The Liverpool Demon"
Michael Golden Knocks 'Em Dead with Exclusive "Walking Dead" Cover for Wizard Indianapolis! Indianapolis-- Renowned artist and storyteller Michael Golden is knocking 'em "Dead" at the upcoming Wizard Indianapolis show! 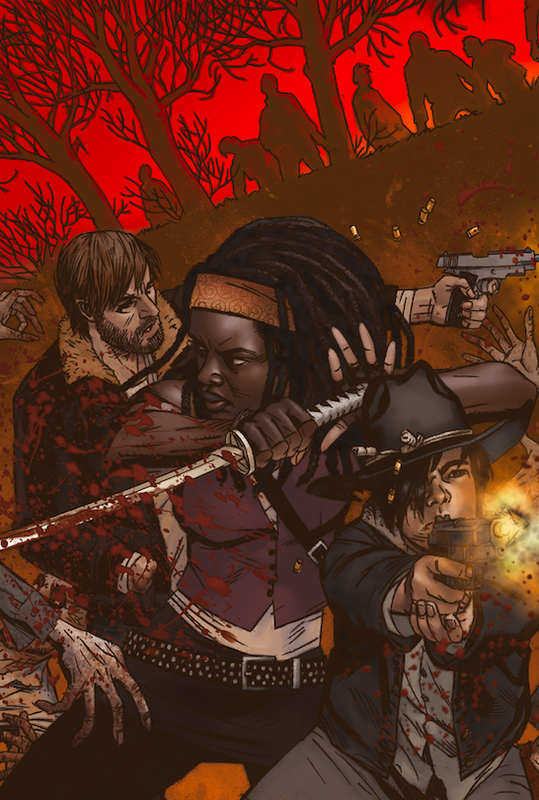 Wizard World, Inc. (OTCBB: WIZD) and Skybound, Robert Kirkman’s imprint at Image Comics, today announced that “Rogue” co-creator Michael Golden has drawn the fourth in a yearlong series of Limited Edition Exclusive Variant Covers of "The Walking Dead" #1 comic, to be provided free to all full-price attendees at the inaugural Wizard World Comic Con Indianapolis, February 13-15. Skybound’s The Walking Dead created by Kirkman, the groundbreaking, Eisner Award winning comic book series, continues to captivate audiences worldwide. 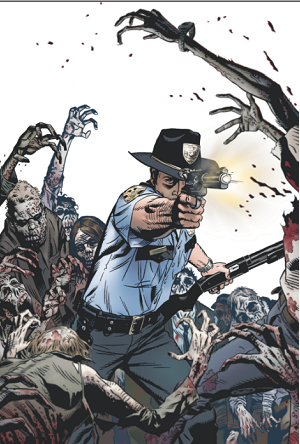 The exclusive "The Walking Dead" #1 edition will be produced in extremely limited quantities and is available at registration to fans at the Indianapolis Convention Center only while supplies last. VIP attendees will receive an additional black & white sketch version of the comic. 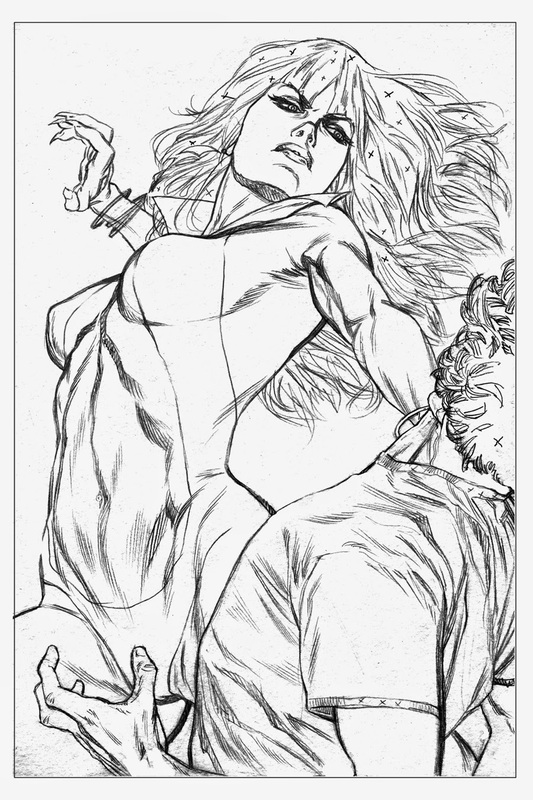 A hugely popular Wizard World guest, Golden has penciled everything from Batman to Captain America to Vampirella. If a fan brings up a character, Golden has probably worked on it at some point in his career. And his ‘Storytelling’ panel is not to be missed by aspiring artists, or those who just want a little more insight into this iconic artist’s work. And in fact, this is the second time that Michael Golden has put pen to paper to collaborate with this popular franchise. 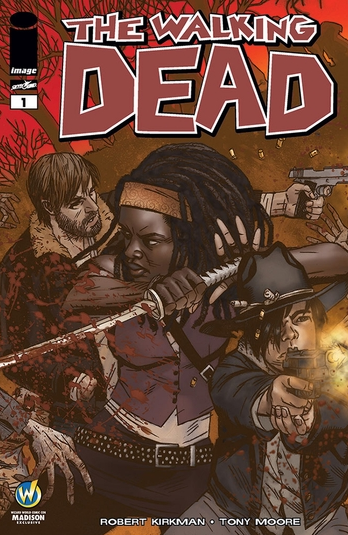 His variant on "Walking Dead" #1 in 2013 was one of the highlights of the series, and one of the hardest issues to find. 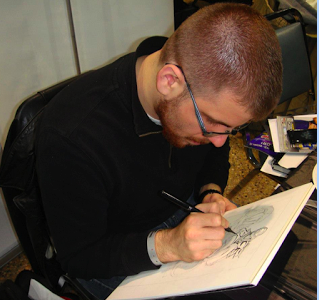 He is often sought out at shows to sketch likenesses of the main characters from the TV series, many of whom will be in attendance in Indianapolis as well. Stars of “The Walking Dead” TV series scheduled to attend Wizard World Comic Con Indianapolis include Michael Cudlitz (“Sgt. Abraham Ford”), Emily Kinney (“Beth Greene”), Sonequa Martin-Green (“Sasha”), Michael Rooker (“Merle Dixon”) and Andrew J. West (“Gareth”). Other top celebrities on hand include William Shatner (“Star Trek,” “Boston Legal”), Liam McIntyre (“Spartacus: War of the Damned,” “The Legend of Hercules”), Katie Cassidy (“Arrow,” “Gossip Girl”), WWE® Divas The Bella Twins™, James & Oliver Phelps (Harry Potter) and many others. In addition to Golden, Artist Alley in Indianapolis will feature John Tyler Christopher (“Amazing Spider-Man,” “Avenger”), Neal Adams (“Batman,” “X-Men”), James O’Barr (“The Crow”), Dr. Travis Langley (“Batman and Psychology: A Dark and Stormy Knight”), Renee Witterstaetter (“She Hulk,” “Avengers”), Troy Brownfield (“Grimm Fairy Tales”), Jeremiah Lambert (“Transformers,” “Tonka Truck”), C.S. Marks (“Elfhunter,” “Ravenshade”), Arthur Suydam (“Marvel Zombies,” “Army of Darkness”) and more. For more on the 2015 Wizard World Comic Con Indianapolis, visit http://wizd.me/IndianapolisPR. 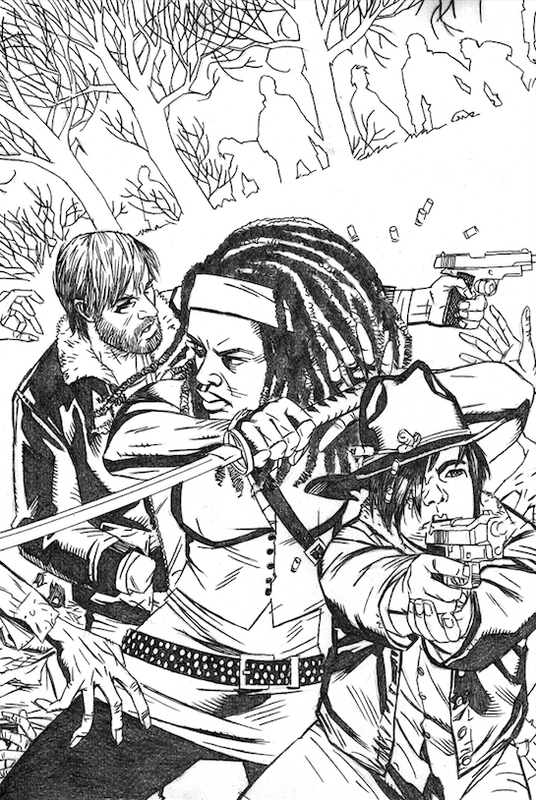 A look at the line art for the new Michael Golden "Walking Dead" variant. Below, after the artists color treatment on the piece, sans logo.